When the last warm days of fall are just a memory and final golden leaves have fallen off the trees. 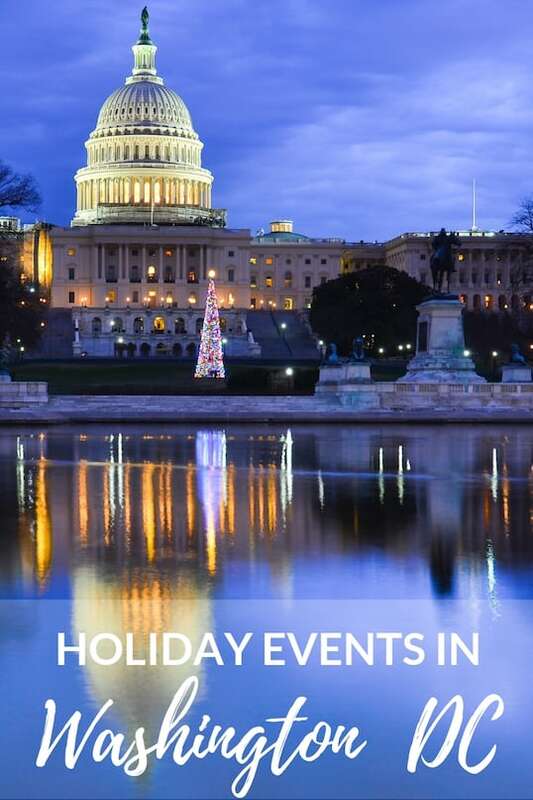 It’s time to enjoy the holiday events in DC and around the nation’s capital. Fountains are transformed into ice skating rinks, gardens into grand light displays, and miniature trains chug through conservatories all around the Washington DC Metro Area. The tallest and prettiest evergreen trees are brought in to decorate The National Mall and surrounding museums. 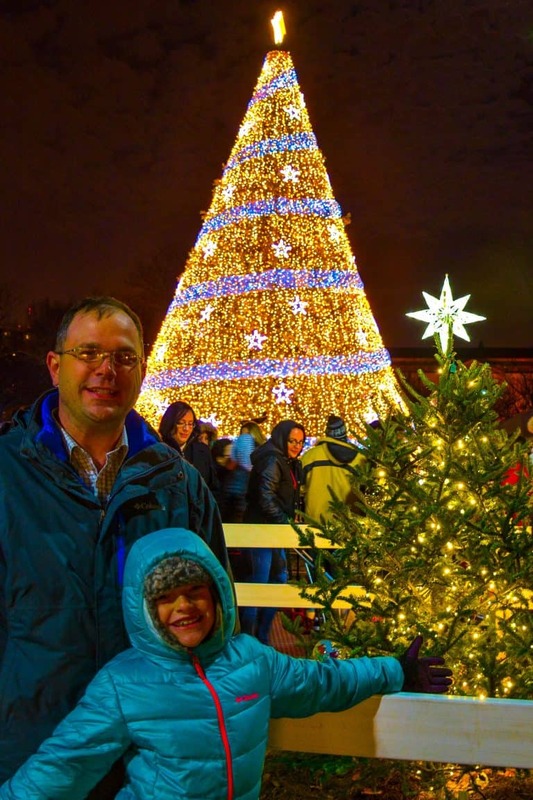 Further afield in Maryland and Virginia, there are many fun family traditions to experience from Baltimore’s Christmas Village and 34th Street Lights in Hampden to the Battlefield Illumination at Antietam. Families visiting Washington DC will want to make sure to stop by the Ellipse to experience one of the best holiday events in DC, the festivities surrounding the National Christmas Tree and National Menorah. Within view of the White House and Washington Monument, there are nightly performances, a miniature train display, and trees representing each of the fifty states for families to enjoy. While always a bit chilly, it’s truly special to see the National Menorah and Christmas Tree lit up at night. The lighting ceremonies for the National Christmas Tree and the National Menorah are spectacular events which require tickets. Tickets for the National Christmas Tree lighting are granted by lottery over a month in advance, but tickets for the family-friendly National Menorah Lighting can be reserved online. The National Christmas Tree is not the only Christmas tree worth seeing in the city during the holiday season. Don’t miss the tree in front of the US Capitol Building or at Union Station. Here’s a list of Family-Friendly Holiday Events in Washington DC within Walking Distance of The National Mall. Check the best deals on family-friendly hotels in Washington DC. Like many zoos across the country, the National Zoo puts on a stunning display of lights for the holiday season. ZooLights at the National Zoo, unlike most other displays, is free to walk through. Grab a hot-cocoa or hot apple cider, enjoy a run on the zoo’s snowless tubing hill or take a spin on the carousel for a complete evening of holiday fun. 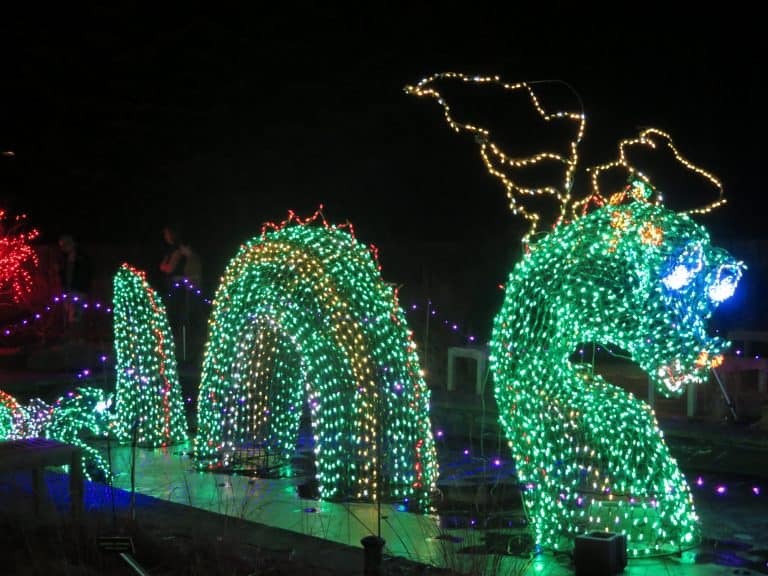 Brookside Gardens in Maryland and Meadowlark Gardens in Virginia also offer intricate light displays for families to walk through during the holiday season. Alternatively, if your family would rather stay warm in the car listening to Christmas music than wander around outdoors on an icy night, consider driving through a light display at the Bull Run Festival of Lights, Festival of Lights at Watkins Park, or the Winter Lights Festival at Seneca Creek State Park in Gaithersburg. Slide Down a Giant Slide of Ice at Gaylord National’s ICE! Just outside the nation’s capital in Maryland, the Gaylord National Resort hosts one the region’s best holiday extravaganzas, Christmas on the Potomac. While families can spend a full day or even a weekend enjoying the festivities at the resort, the highlight of the event is a walk through the 9 degree Fahrenheit ICE! Each year this colorful display is carved by artisans from Harbin, China and has a new theme. The theme for 2018 at Gaylord National is A Charlie Brown Christmas. The expressive, colorful characters really bring the cartoon story of Charlie Brown alive for a new generation. 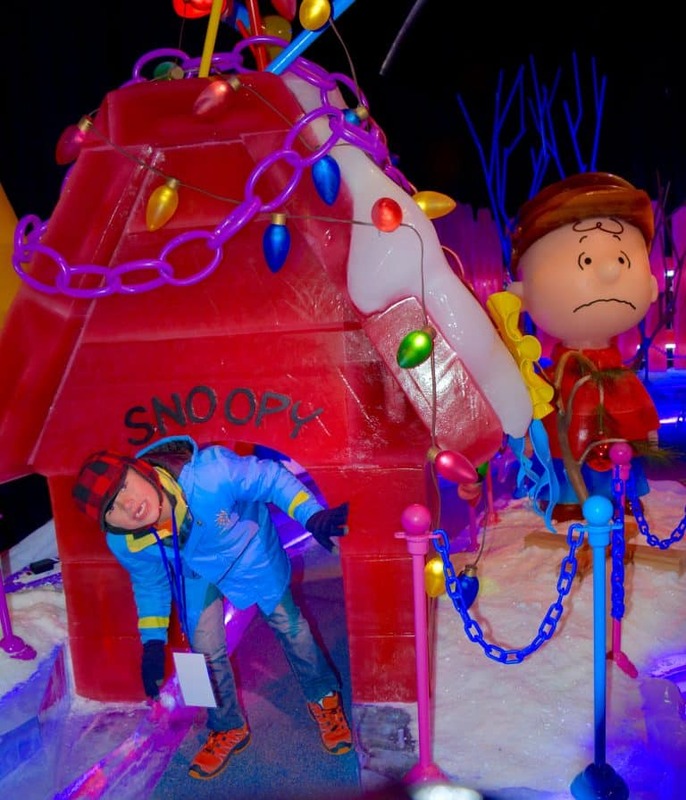 Snoopy’s dog house carved out of ice provides the perfect family photo opportunity. As always, the slides are a favorite! On the day that we visited, they were slick and fast; my children raced each other again and again down through the two-story slides. Each year the final room of ICE! features a nativity scene. There’s no color added to this simplistic, peaceful scene, and the intricately carved clear ice reflects in the most beautiful way. There are various packages available so that families can enjoy all the activities that Christmas on the Potomac has to offer including a tot-sized train ride, the seasonal Glacier Glide Ice Rink, and a gingerbread decorating experience. Fans of the classic A Charlie Brown Christmas television special should plan to make reservations and arrive early to their ICE! experience so that they can enjoy a character breakfast with Charlie Brown and his friends. There are festive, outdoor ice skating rinks scattered all around the Washington DC metro area from Baltimore’s Inner Harbor to Tyson’s Corner in Northern Virginia. 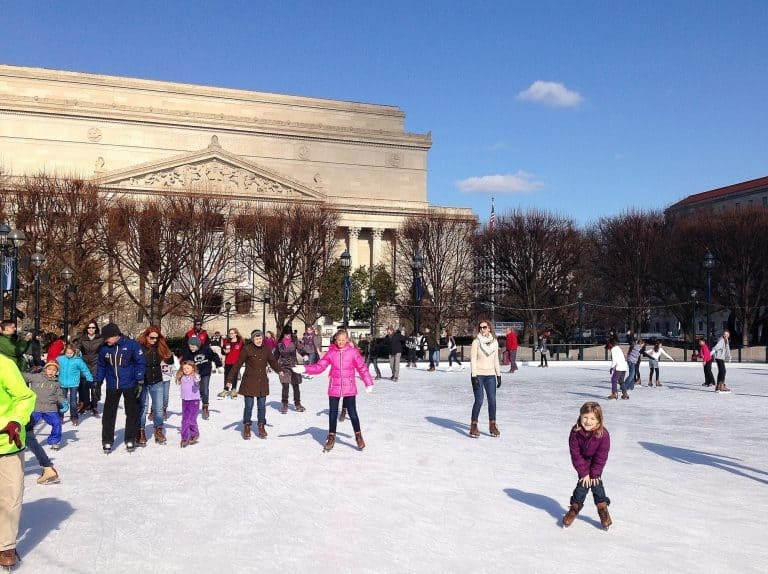 Families visiting the nation’s capital for the holidays should not miss the opportunity to twirl around the ice at The National Gallery of Art Sculpture Garden’s Ice Rink, positioned with a memorable view of the National Archives building. Outdoor ice rinks can also be found at Rockville’s Town Square, Silver Spring Veteran’s Plaza, Georgetown’s Washington Harbour, Canal Park, and Pentagon Row. The popular, free Season’s Greetings holiday display at the United States Botanic Garden is another must-see for families visiting Washington DC for the holidays. 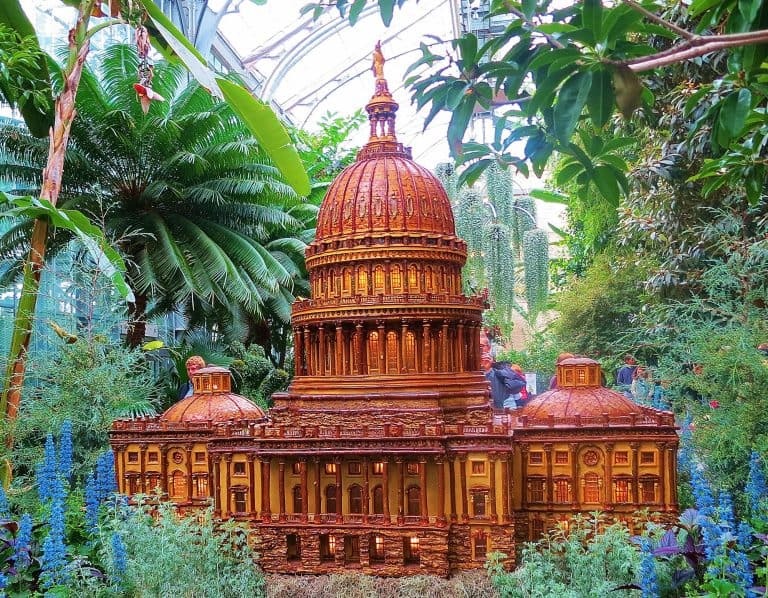 Models of the city’s major landmarks such as the Smithsonian Castle, US Capitol Building, and Washington Monument are constructed out of plant material and displayed in the entrance to the conservatory. There is also a model train for kids to enjoy. If your little ones just can’t get enough Christmas-themed model railroad fun, Brookside Gardens and Union Station also have annual model railroad exhibits on view for the winter holiday season. There’s more transportation-themed fun for the little ones out at the College Park Aviation Museum. Come by the museum for their annual Santa Fly-In the first weekend of December or their model train exhibit brought in by the National Capital Trackers the third week of December. 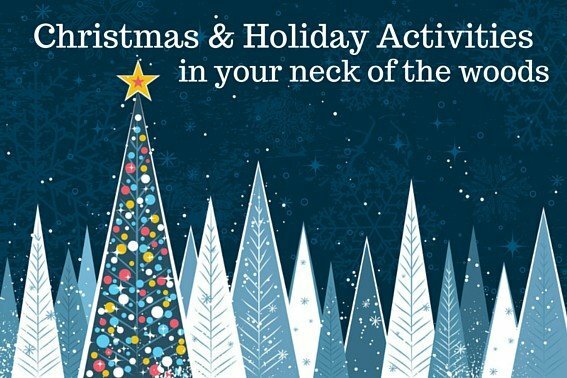 For more family-friendly holiday activities nearby Prince George’s County, check out this list of places to Celebrate the Holidays in Prince George’s County, Maryland. 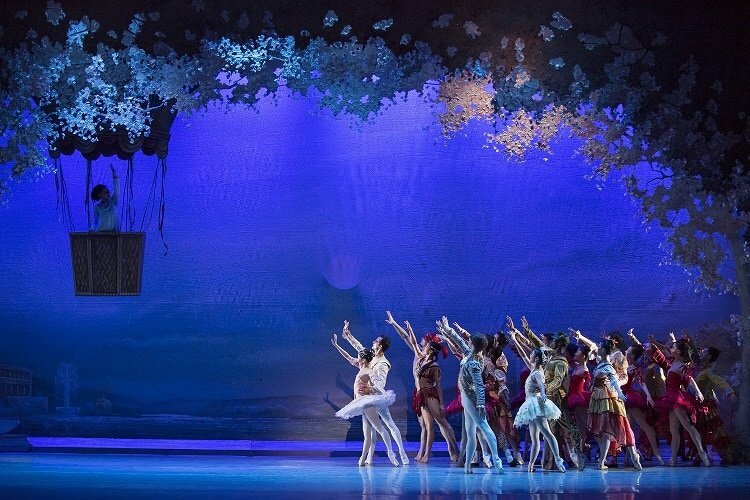 If your family enjoys ballet, Septime Webre’s all-American version of this classic tale danced by the Washington Ballet at the Warner Theater is a must-see. Appropriately, the Washington Ballet’s Nutcracker story is set in 19th century Georgetown with dancers portraying the usual characters as well as historical figures, such as George Washington. After intermission, it’s not snowflakes that spin round the stage, but cherry blossoms in this unique production with a true local flavor. The historic Ford’s Theatre is the setting for a classic production of Dickens’ A Christmas Carol. The actors and actresses at this intimate theater venue tell the classic story of Ebenezer Scrooge on the stage just below where President Lincoln was assassinated 150 years ago. While waiting for the theater to open, take the time to walk through the museum and pay your respects to one of the most respected presidents in US history. Wolf Trap’s Holiday Sing-a-long is free and possibly the most remarkable annual holiday concert in the area. Highlights include performances by local choirs and the United States Marine Band, complete with a traditional candlelight processional at the end of the performance. 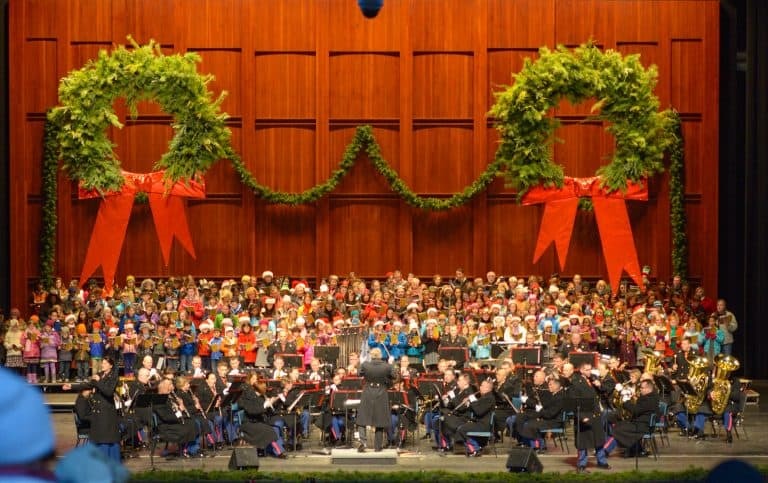 If your family wants to stay closer to the city, there are plenty of other venues that host annual family-friendly holiday concerts. The Washington National Cathedral holds a Christmas concert especially for families, including a Christmas carol sing-a-long for children. 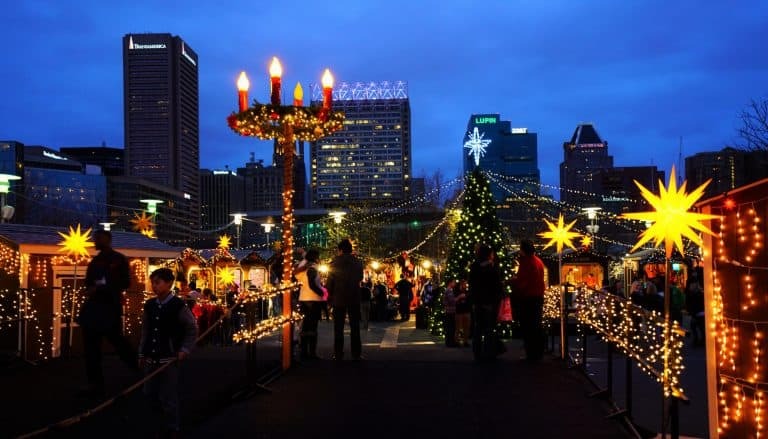 Baltimore’s Inner Harbor is converted into a traditional German Christmas Market annually during the winter holidays. The event features more than fifty vendors, two Christmas trees, and plenty of activities for the children. The Christmas Village is also the perfect place to grab a tasty meal or snack while enjoying other winter activities around Baltimore. The PANDORA Ice Rink at the Inner Harbor Amphitheater and a 4-D showing of a holiday movie at the National Aquarium are two more items not to be missed. 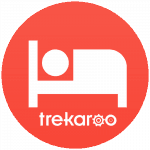 Check for amazing deals on hotels in Baltimore. On the first Saturday of December every year, 23,110 luminaries are lit at Antietam National Battlefield to signify the soldiers who died, lost or injured in one of the bloodiest one-day battles in American history. 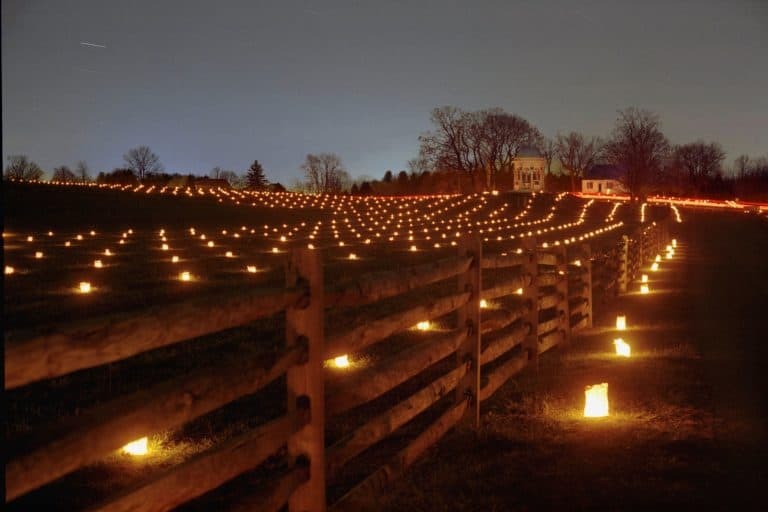 While not a traditional holiday event, the Illumination at Antietam occurs during the holiday season every year. This unique event is a great opportunity to take a mini-road trip from the District out into Western Maryland to experience some local Civil War history with the family. For a lighter-spirited event out in Frederick County, consider the Walkersville Southern Railroad’s annual Santa Train. After the ride, hot chocolate, and cookies are served up back at the train depot. Check out this list for more unique holiday events in Washington County and Frederick County Maryland. Most families think of visiting Annapolis, known for its sailing and seafood, during the warmer months of the year. However, my family visited Maryland’s capital city in December and found a charming town decked out with Christmas trees, holiday lights, and festive shop windows. The Maryland State House should be near the top of any visiting family’s itinerary regardless of season, but during the holidays it is especially impressive with dozens of Christmas trees decorated by each county in Maryland. Yes, only in Maryland will families find Christmas trees decorated with crab and oyster shells in the State House. Further down Main Street, there are plenty more lights and decorations. For the second year, one of the alleys across the street from the super kid-friendly Chick & Ruth’s Delly has become “Snowflake Alley,” a narrow street decorated with twinkling snowflakes. Just a few blocks away, one of the most beautifully decorated storefronts in the city belongs to the Annapolis Bookstore. Our entire family fell in love with this bookstore. The kids spent some time playing in the adorable garden out back while I enjoyed picking out a couple of unique books that the kids will treasure for a lifetime to go under our Christmas tree at home. 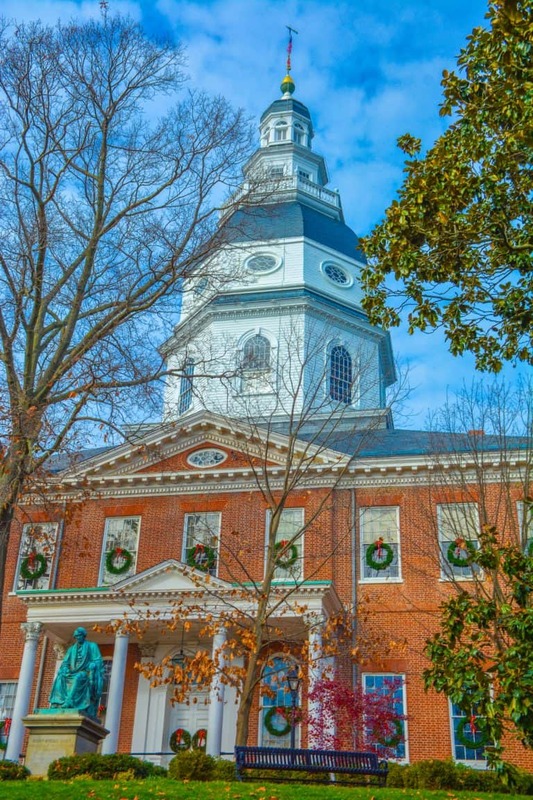 Visiting Annapolis in December? 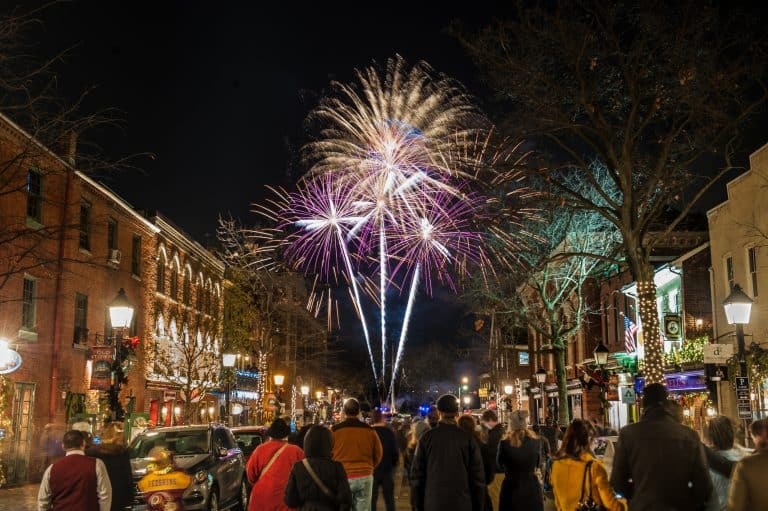 Check out this list on Celebrating the Holidays in Annapolis. Planning a weekend getaway to Maryland’s Capital? Here’s An Itinerary for a Family-Friendly Annapolis Weekend Getaway. The beautiful streets of Old Town Alexandria are even more festive during the holiday season. 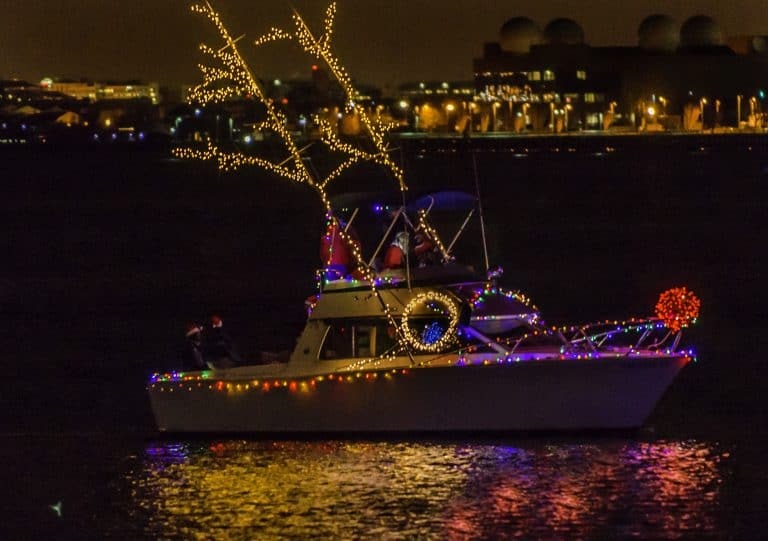 Be sure to check out the annual Holiday Boat Parade of Lights where more than 50 lighted boats cruise the waterfront to the delight of onlookers. On Christmas Eve, watch Santa taking the Potomac on his water skis for the 30th year. Kids love seeing Santa zooming across the water on his skis with his reindeer and Frosty. The party really gets started for families in Old Town Alexandria on New Year’s Eve. Lasting from 2PM till midnight, First Night Alexandria is the largest family-friendly New Year’s Eve party in the region. Torpedo Factory Art Center and the Alexandria Archaeology Museum are just a couple of the 22 indoor venues hosting more than 100 live performances in 2015. Finally, at midnight, a fireworks finale rings in the New Year with a colorful display over the Potomac River. Check for the availability at family-friendly Hotels in Washington DC.